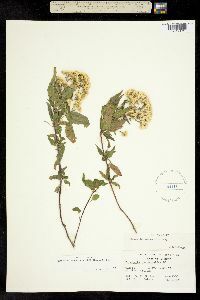 Ageratina paupercula (A. Gray) King & H.E. Robins. Perennials or subshrubs, to 100 cm. Stems erect, puberulent to glabrate. 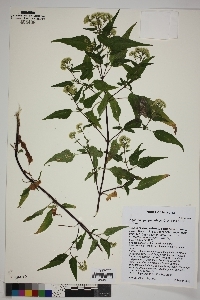 Leaves opposite; pet-ioles 3-15 mm; blades narrowly to broadly lanceolate, (2-)3-7 × 0.5-1.5 cm, margins coarsely and remotely serrate, apices long-acuminate, abaxial faces sparsely pubescent. Heads clustered. Peduncles 2-6 mm, puberulent. Involucres 2.5-3 mm. Phyllaries: apices acute, abaxial faces puberulent-hispidulous. Corollas white, lobes sparsely hispid-villous. Cypselae glabrous. Flowering Mar-May. Rocky slopes, crevices, gravelly, sandy streambeds, pine-oak woodlands; 1000-1800 m; Ariz.; Mexico. Ageratina paupercula is recognized by its early spring flowering, relatively small and usually narrowly lanceolate and acuminate leaves, relatively small heads in clusters, and relatively small (1.2-1.4 mm versus mostly 2-3 mm in other species), glabrous cypselae.